Stars: Paul Newman, Steve McQueen, Faye Dunaway, Robert Vaughn…..
Portions of the movie may or may not be revealed. At the opening party of a colossal, but poorly constructed, office building, a massive fire breaks out that threatens to destroy the tower and everyone in it. I decided to watch this one yesterday afternoon. Why? I had seen an article on “Airplane” and that got me thinking about the seventies disaster movies. I had two hours with nothing pressing to do, so I turned it on. The movie is over two hours long, which may be a little too much for those weaned on Michael Bay and Roland Emmerich. 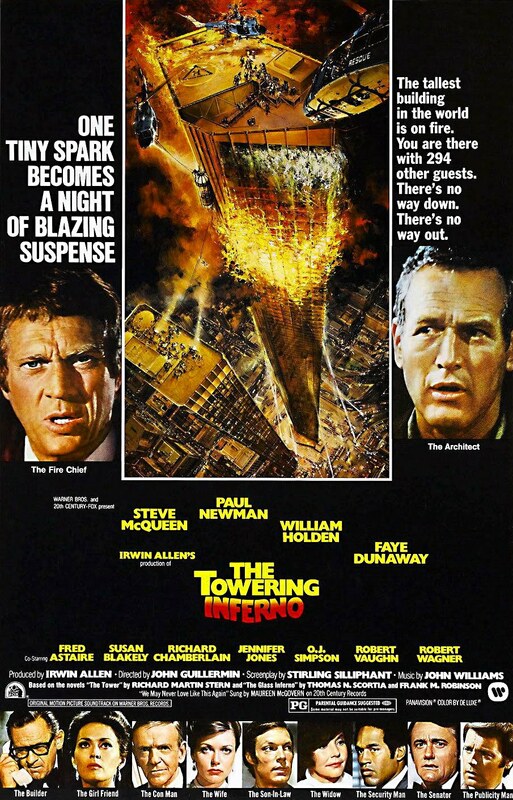 However, The Towering Inferno sticks to the seventies formula of disaster movies wherein it develops its characters, then does its best to kill them off. Inferno also includes the list of Hollywood A-listers (for that time) such as Faye Dunaway, Richard Chamberlain, Steve McQueen and Paul Newman (who my children know only as Doc Hudson from Cars), “faded stars” such as Jennifer Jones, Fred Astaire, William Holden as well as a few “in the background, I know that guy/gal: O.J. Simpson, Robert Wagner (Hart to Hart), and Gregory Sierra (as a child of the 70s, I know him from Sanford and Son as well as Barney Miller). They all interact in one way or another, giving the audience snippets of their personal drama. By the time we get to love/hate the characters, the real villain of the movie, the fire, is in full force. While the special effects are a little spotty, I have to say, this movie does a lot better with its accurate portrayal of fire and people on fire than some of the movies today. Sure, you can see the stuntman’s gloves as he’s engulfed in flames, but I’m so impressed that they actually SET SOMEONE ON FIRE to get a shot, I don’t even care. It is a movie after all. It had been so long since I’d seen the film, I wasn’t sure who was going to live or die, which added to the suspense. The movie was well paced, in that it balanced action scenes with quick bits of drama and further character development. The effects and shots of the burning tower were quite realistic: kudos to the model makers and special-effects photography – it’s a sight better looking than anything produced by the SyFy channel. In fact, I found myself so engrossed with who was going to live/die, that the effects were secondary, but quite convincing. Is the movie dated? It depends, I suppose on your point of view. I went into the film to enjoy it, not to point out flaws or issues. I simply set all that aside and kicked back. Certainly, some of the fashions will make you look twice and comparisons to 9/11 are inevitable, but all in all, it’s a pretty good movie, even over forty years later. Grade: A – Watch it for nostalgia, stay for the action and drama.